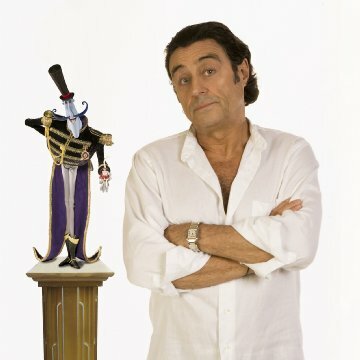 In Quebec, the French version features the voices of Catherine Brunet, Geneviève Brouillette and Jean-Michel Anctil. 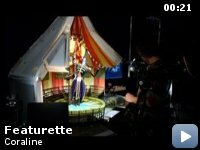 Revealing mistakes: (At 49:52) During the Other Forcible's trapeze act when she says "In action like an angel" the lines where the puppet's head comes apart are clearly visible. OK America, before you go blindly into an animated film with your young children, why don't you do a little research on what they are about to witness. A PG rating and stop-motion animated aesthetic do not always make a child-friendly adventure. 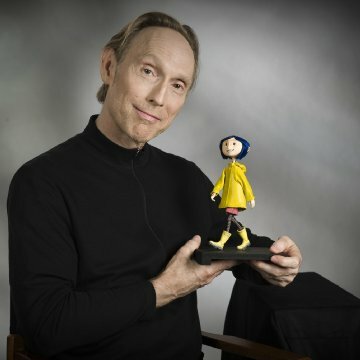 Based upon the horror novella by acclaimed author Neil Gaiman, Henry Selick's Coraline is chockfull of heavy material, dark story threads, and bleak possibilities. For a guy like me, those things equal undivided success; for a child aged ten, those things equal nightmare filled evenings and parents writing angry letters to Focus Features for subjecting their children to lewd and horrific imagery. Well guess what parents? No one is to blame but you. I'm not saying keep all youngsters away, but do use some discretion on whether your son or daughter can handle the fantastical elements. This is very much Alice in Wonderland displayed in all its non-Disney possibilities. A cautionary tale on being careful what you wish for, our heroine must discover the difference between a world of people neglecting her and that of people doing all they can so that they may give her all she could ever want in the future. Life is not about getting it all right now, but instead a slow and steady climb built on love and trust, one whose benefits far outweigh the whirlwind romance that is never truly as it seems. Remember folks, this is a story that won the 2002 Bram Stoker Award for Best Work for Young Readers; it's not all sing-songy like Selick's masterpiece A Nightmare Before Christmas. With that said, however, it is very, very good in a very, very different way. Be prepared for a methodically and deliberately paced story. 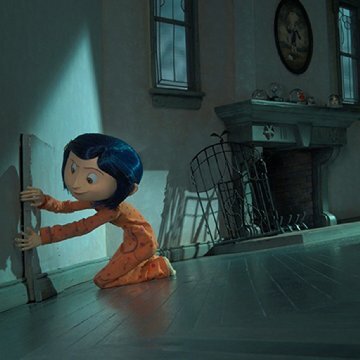 More psychological terror than jump out at you scares, the tale of Coraline escaping into a parallel world, perfectly mirrored of her own only inhabited by animated dolls, is one of enlightenment and discovery of what love truly means. Do we all want the parents that dote on us? The guardians that will do what we want and when we want it? Of course we do. But that idyllic utopia doesn't exist, especially in the times for which we live today. Children need to be raised and supported and that takes money and a lot of hard work. 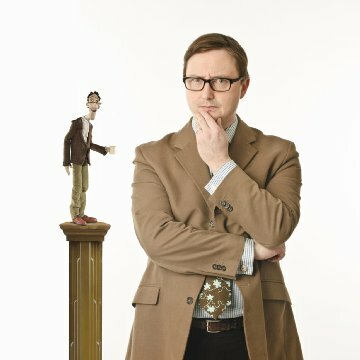 What may seem like neglect in the eyes of a child is really two people doing all they can, sacrificing their time, in order to give him/her a chance at success. 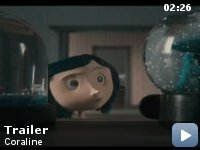 Only when Coraline sees the manipulation and truth behind the "kindness" her Other-Mother gives her does she realize what she has back at home. What we are shown is a world through a tiny door in the wall of an old triple-segmented home. There are stories about this door used to explain the disappearances of some local children, including the sister of loudmouthed and shy Wybie Lovat's grandmother. Only a weathered black cat appears to know what is going on, what the too good to be true farce beyond the door is actually masking behind it. This cat can travel between worlds and therefore knows it all, allowing him to warn Coraline by orchestrating events via those she encounters. A disgruntled child is easily malleable and fooled when doted upon and given sweets and a smile. The mantra "never talk to strangers" is never more applicable than it is here. 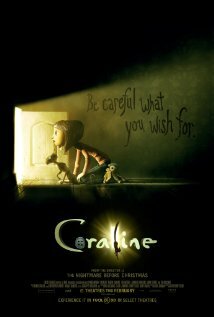 With something a tad off-kilter in the fantasy world, Coraline finds herself shaking it off and relishing the opportunity to experience all that she had dreamed of, not knowing that if her parents succeed with their new gardening catalog, those dreams will be fulfilled in reality. Patience is a virtue and youngsters unfortunately don't learn that fact until they are all grown up, finding ways to apologize to their parents for being such confused and naïve monsters. With some very nice voiceworkDakota Fanning shines as our titular heroine; Keith David's baritone brings the cat's mixture of foreboding and help to life and Robert Bailey Jr. gets the nervous tick and stammer on the nose for Wybie, (short for WhyBorn, now that's a name you hope your parents never considered)you do find yourself enveloped in this world. A rare thing for an animated film to begin with a cast listing, it thankfully doesn't detract from the escapism by making you think of the actor rather than the character. This fact works best with the mother, played by Teri Hatcher. I would never have been able to pick her voice out, but that just enhances it all the more, breathing life into the stop-motion clay form on screen, becoming the wolf in sheep's clothing villain necessary for it all to work. 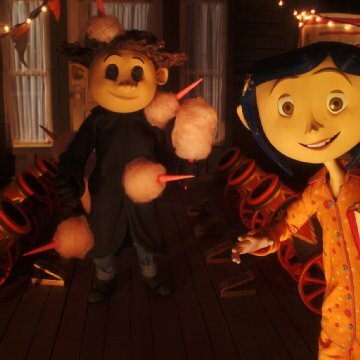 Definitely soak in the aesthetic and intelligent storytelling as Coraline is for a thoughtful audience willing to delve deep into metaphors and hidden meaning. There is no "approved for your Attention Deficit Disorder child" stamp of approval here. In much the opposite direction, don't be surprised if your child hates you for making them sit through it. However, it is a tale that will resonate for a portion of the public, hitting on their own feelings of selfishness and wanting the spoils without the work. When your child is intellectually mature enough to handle a rich and deep story, you as a parent will know. 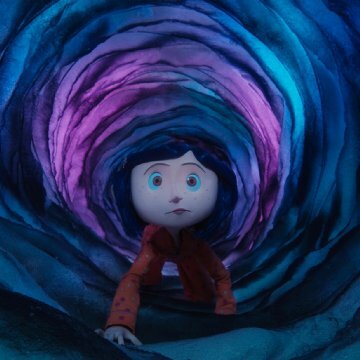 When he or she can see a couple of big-bosomed, large older women dressed as mermaids with pasties and not laugh or get uncomfortable, that is when you should let them see Coraline. It is ultimately a film for all ages; one that shows you as adults how it all will get betterjunior will one day understand the sacrifices you are makingand you children a fantastical world to escape to with consequences that will shake you into the realization of what you have right in front of you at home.